Security forces in Honduras attempted to clear the streets of barricades erected by supporters of presidential candidate Salvador Nasralla on Monday. More than two weeks after the election, no official winner has been declared although the electoral authorities say the incumbent, Juan Orlando Hernández, has the most votes. Mr Nasralla wants the election to be annulled on grounds of fraud. The disputed result has triggered protests, some of which turned violent. 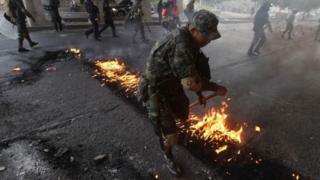 The security forces cleared the streets of burning tyres and other debris on Monday after Mr Nasralla called on his supporters to keep up their protests. Mr Nasralla had earlier dismissed a partial recount of ballot boxes after it failed to change the official result. The official result gives President Hernández a 1.6 percentage point lead over Mr Nasralla. But the Organization of American States has said the vote was "marred by irregularities". Mr Nasralla has been suspicious about the result ever since his initial lead of five percentage points faded away as more votes were counted and he was overtaken by President Hernández. The electoral tribunal has until 26 December to announce the official winner. Thousands of people have taken to the streets in rival demonstrations since the election on 26 November. Human rights group Amnesty International says 14 people died in days of clashes but there has been no official confirmation of the number of dead.